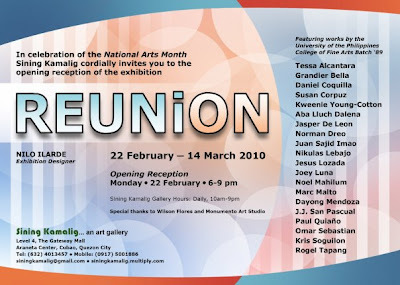 In celebration of the National Arts Month, Sining Kamalig will feature the works of the University of the Philippines (Diliman) CFA Studio Arts Batch of 1989 in "REUNION", their get-together show from 22 February to 14 March, 2010. After twenty long years, the batchmates decided to show their passion for the arts by staging an exhibit. Instead of having a regular reunion over beer and chips, they opted to get hold of their muses, sit down in their studios, and showcase their latest works to the public like true artists (albeit still with beer and chips). This exhibition is symbolic of their unwavering fervor in sharing their talent and craftsmanship with one another and the world. Although some have pursued other careers, they continued creating works of art. The participating artists are: Tessa Alcantara, Grandier Bella, Daniel Coquilla, Susan Corpuz, Kweenie Young-Cotton, Aba Lluch Dalena, Jasper De Leon, Norman Dreo, Juan Sajid Imao, Nikulas Lebajo, Jesus Lozada, Joey Luna, Noel Mahilum, Marc Malto, Dayong Mendoza, J.J. San Pascual, Paul Albert Quiaño, Omar Sebastian, Kris Soguilon, and Rogel Tapang. Exhibition design is by Nilo Ilarde. The public is cordially invited to the opening reception on 22 February 2010 from 6-9 pm. Sining Kamalig is an art gallery situated at the 4th Level of the Gateway Mall, Araneta Center, Cubao, Quezon City.